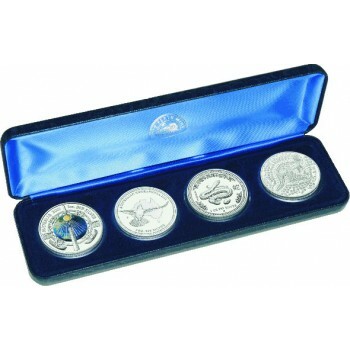 The 2001 Australian 4-Coin Silver Millennium Set consists of 4 x 1oz 99.9% silver coins, three of the coins are struck from the Perth Mint and one is from the Royal Australian Mint. Housed in a stylish presentation case the coins deplict designs from ancient egyptian times to the mordern era. The first coin deplicts one of histories most important human structures "THE CLEOPATRA"S NEEDLE" , this stucture was used to accurately measure the solar year nearly 7000 years ago. The second coin in this spectacular set deplicts the iconic Australian Kookaburra in flight over the australian map. The third coin is deplicting the lunar year of the snake and last coin in this beautiful set is deplicting the most iconic animal in Australia the Kangaroo.